Next up in the "even I'm not crazy enough to go there" category comes the tale of the Kobo Aura H2 SubZero. Launched last year, the Kobo Aura H2O is IP67 certified, meaning it is both dust and waterproof to a limited degree. But that doesn't necessarily mean it will survive being frozen, so Chalid felt the need to answer this question empirically. He dumped it in a pan of water and stuck it in the freezer overnight. After 16 hours, it was frozen in a block of ice. He had to let it thaw out the slow way, of course;the device may be waterproof but that won't keep the plastic from shattering due to the low temperature. 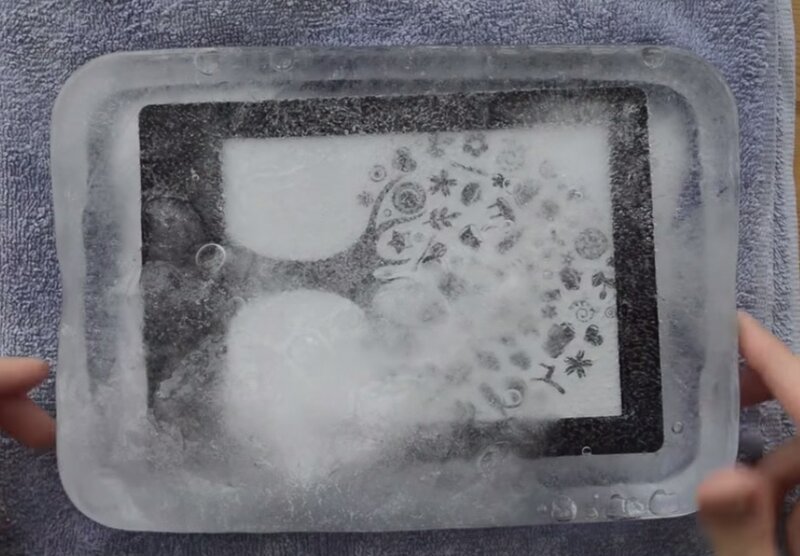 Once it was fully thawed, Chalid woke up the ereader and he reports that it works just fine. The screen, touchscreen, and electronics all worked. The cold spell did drain the battery, for some reason, but there's no sign that the loss was permanent. So tell me, what do you think Chalid should do for the next test? Put the Aura H2O in a microwave? How about testing to see if it will blend? I'd like to instead see him put the Tolino Vision through the ice block test. Later models of that ereader are waterproof, but since it lacks certification there's no way for us to tell how rugged it really is. Update: Or maybe not. Chalid mentions in his post that the new Tolino Vision gets its water protection from a nanocoating on the electronics. It probably wouldn't survive being frozen in a block of ice. I could have sworn I read the post; maybe that part was eaten by Google translate. Kobo readers will spontaneously freeze on their own, though. You don’t have to do anything yourself.